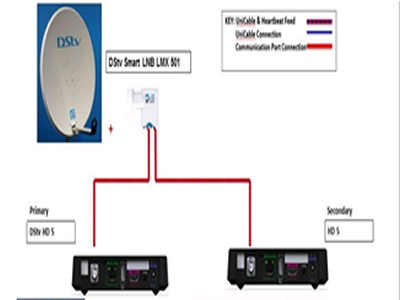 To connect DStv Zappa Decoders services The service is designed to enable you to use one subscription on at least two DStv decoder. For example, if you have a Dstv premium sub and you want to enjoy it both in your room and in the living room, the extra view is the way to go. Track DStv on 36e and get a high signal strenght. Next, replace the regular LNB with the smart LNB. Connect the A to the primary decoder and connect the C to the secondary decoder.